Blues Bender A professional instrument designed for those learning to play the blues. 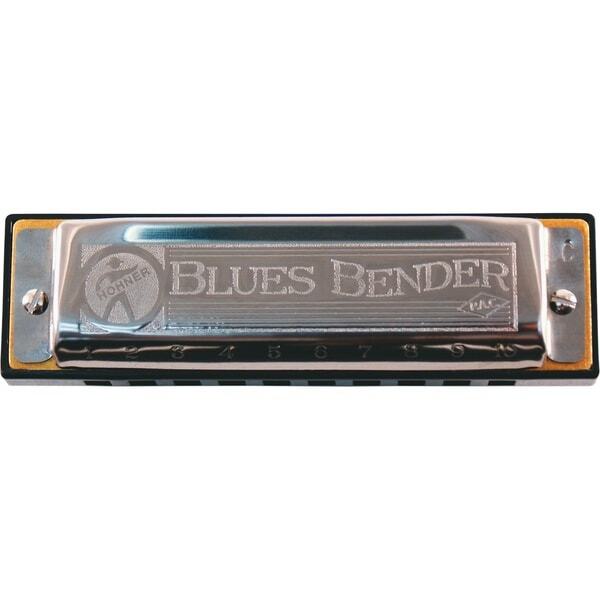 Designed primarily to make playing and note bending easy for entry level players, the Blues Bender P.A.C. allows everybody access to the bluesy notes needed to make any riff complete. The Blues Bender P.A.C. features "Patented Acoustic Covers" from the Marine Band Harmonica, the all time favorite amongst serious players since 1896. Originally patented by Jacob Hohner in 1897, the special shape of the cover increases the volume of air enclosed between the reeds and cover-plates which, when thrown into vibration and vented through the special side vents, allows for greater volume and projection. The Blues Bender P.A.C. features thicker than normal reed plates for a consistent tone. It is extremely airtight between the mouthpiece and the reed plates, allowing for easier note bending and making expressive playing easier. "The Blues Bender P.A.C. is the perfect harp to learn on and we expect it to be a very popular addition to our product line," commented Scott Emmerman, Director of Marketing & Sales. "A fantastic first harp to develop your chops on." - Roger Edsall (harp player with the band Bad Influence) "The Blues Bender P.A.C. is a killer value." - Lil' Ronnie (of Lil' Ronnie and the Grand Dukes) Professional harmonica player Lil' Ronnie (of Lil' Ronnie and the Grand Dukes) rated the Blues Bender P.A.C. as his top choice for ease of playability, note bending, and consistent volume and tone when compared against other models.